Repair trunks are crafted similarly to Bric-a-brac, in that they can be made from various source materials depending on what you have available. They come in four categories of increasing expense, with the highest category saved for high-end modules like the Power Saw or Steam Oven. This material versatility should allow players of any biome to keep their modules up and running while imposing a continuing production requirement that will keep your carpentry, ceramics, et al workshops busy over the long term. Upkeep required will be displayed in each workshop, as a total of the upkeep of all modules within (Currently this UI is being worked on). 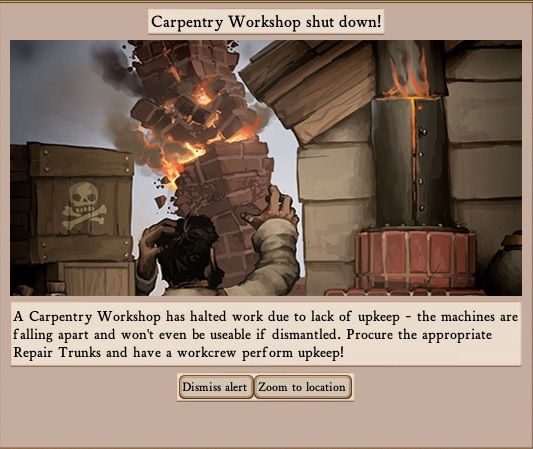 When the time comes, workers in that building will automatically perform repairs as necessary using the required repair trunks – failing to meet the weekly upkeep for a building, on the other hand, will result in the workshop shutting down! You may ask yourself: ‘Won’t this make it harder for me to keep my huge colony running?’ Yes! You’ll have to worry about supply lines, maintaining resources, and not overbuilding – GAMEPLAY! These numbers are all still to be tuned, and I have some plans in mind as regards module and building construction costs, as well as military upkeep but we’ll talk about those later. For now; Be vigilant! Maintain your modules! Your colony may yet survive to see another day. As long as you’re adding trunks to workshop you can may be have out put trunks and input trunks rather to rely on unwieldly stock piles lying all around the colony. If a shop never gets used, does it need maintenance? If I have 3 carpentry shops and route my orders through one, would all 3 come up for maintenance? Does a huge carpentry shop with multiple power saws require the same number of repair trunks as one a small one? Good idea in general, but,from my personal point of view, at the moment the amount of required repair trunks is just to high. 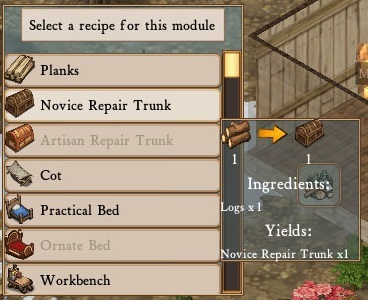 with a small starter colony, (1x carpentry, 2x small low class houses, 1x kitchen) I already require 30+ repair trunks (for 9 beds, two carpenters workbench, an oven, a workbench and a brewing vat). This needs tuning urgently. With this rate the only thing my carpenter can do is produce repair trunks all day. 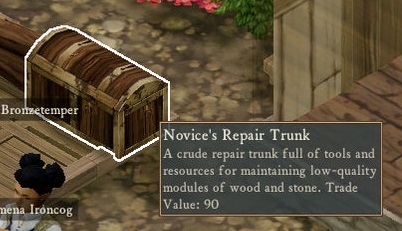 As far as things go for me, a specific “repair trunk rate” dependent (only) on the building size would be more appropriate, or reduce the amount for single components. Further we need more wood, may it be due to regrowing trees natural or having the possibilitie for a “tree farm” from the beginning (like bamboo).